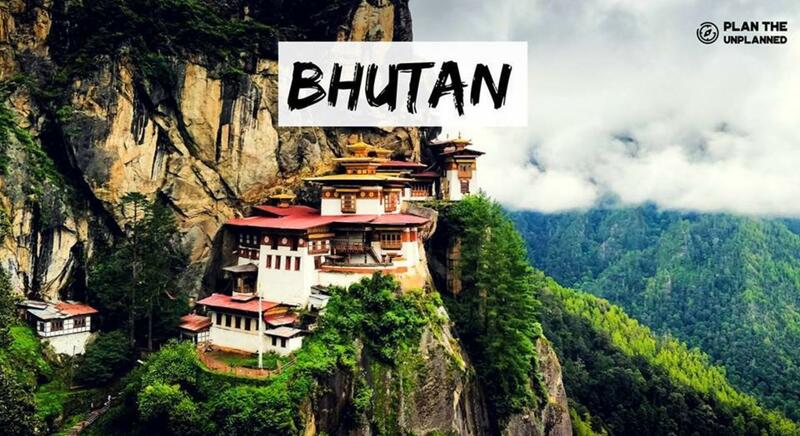 “The Land Of the Thunder Dragon” – as it is rightly called, Bhutan is a little Himalayan hamlet that has gained the title to be the “Happiest Country”. And you shall feel the vibes of happiness all around you – as soon as you’ll entire Bhutan. With lofty Himalayan mountains, gusty rivulets crossing the valleys, the aroma of Momos and Datshi in the air, colourful prayer flags and huge Dzongs – Bhutan can never fail to mesmerize the visitors. This 7 – days road trip through the towns and countrysides of Bhutan will let to see the country’s diverse sides, visit the numerous old forts and hike up to one of the highest monasteries in the world – and you shall return back home, a lot happier! You will have to reach Bagdogra before 12 pm so that you do not miss out the bus that departs to Phuentsholing from Siliguri town to phunetsholing town at 2 pm. Alternatively, there are cabs that you could hire and reach Phuentsholing on 15th November. Today we travel towards the northern end of Thimphu valley to reach Tango Monastery. The hike up to the Monastery follows a zig-zag trail through forests filled with oak and pine trees. Keep a look out for the magnificent rhododendron flower trees as well which will be in full bloom during the spring season. The Tango monastery built in 1689, is presently the centre for higher studies for monks and offers breathtaking views of the surrounding regions and is guaranteed to help you find your inner peace. After breakfast, we will go on a short hike to the Khamsum Yulley Namgyal Chorten, which is a fine example of Bhutanese architecture and artistic traditions and stands out on a beautiful ridge above the Punakha valley. This temple has been dedicated for the well being of the kingdom, its people and all sentient beings and offers a beautiful view of the Punakha Valley. Once here, you have the option to raft back on the Mo Chhu River (On the spot reservation). The latter half of the day will be spent visiting the Sangchchen Dorji Lhuendrup Nunnery which is a large temple complex located on a ridge amidst pine trees and offers one much opportunity to explore. Our next stop is the Phobjikha or Gangtey valley. From the small hilltop overlooking Gangtey Goemba, we will head downhill through flower meadows to Semchubara village and from here through beautiful forests and into the open valley. The trail ends with a community school and a 15th-century Buddhist temple called Khewa Lhakhang which features three two-storey statues of the past, present and future Buddhas. In the valley, we will visit the Gangteng Monastery. During winter, black-necked cranes visit central Bhutan to roost, circling the monastery three times on arrival and repeating the same when returning to Tibet. Apart from it being home to the sole international airport in Bhutan, Paro Airport, Paro is a historic town with about 155 temples and monasteries. Rinpung Dzong a fortress-monastery overlooking the valley houses within it a collection of sacred masks and costumes. The national museum, Ta Dzong, is also set in Paro. Hence, Paro preserves the rich cultural traditions of the country. The last day of our wonderful Bhutanese backpacking trip starts with an early morning excursion to the most breathtaking spot in Bhutan. The Taktsang Monastery or the Tiger’s Nest perched majestically on a cliff which is 2,950m above sea level, defies all engineering logic. The energetic can take a two-hour hike up to the cliff or a pony ride can be arranged at an additional cost. We will also visit one of the oldest temples in Bhutan called Kyichu Lhakhang and interact with the locals at a farmhouse. The evening will be spent exploring the outskirts of the town of Paro together. 1. Min number of travellers required for the event to happen is 5. 3. is mandatory to reach Bagdogra on/by 15th November 2018 before 12 PM. 4. You need to carry the Original Passport and 5 Passport size Photographs. Make sure your passport has a validity of min 6 months. 5. Personal expenses are to be borne by you. Travel Insurance isn’t required for your trip to Bhutan. Currencies of INR 10, 20, 50, 100, and 500 can only be used! 2000 INR notes will not work in Bhutan. You can also exchange currency while in the country. 6. Alternatively, one can take a Bus from Siliguri to Phuentsholing. The timing of the bus is 2 PM and it would cost about INR 150- 250/person. 7. If anyone is taking a flight directly to Paro, transport can be arranged at an additional cost. You should inform us about your timing and plan so that we can arrange everything accordingly. 8. You can check the cancellation policy by clicking on the cancellation tab. 9. You may book your return ticket for 24th Nov 2018. -If you cancel the plan after 15th Oct 2018 – No Refund.